Renata Tebaldi canta "La Wally"
Renata Tebaldi sings "Nel cor piu non mi sento"
Re: Renata Tebaldi "Un bel di vedremo"
Tebaldi was born Renata Ersilia Clotilde Tebaldi in Pesaro on 1 February 1922. She was the daughter of a cellist, Teobaldo Tebaldi, and Giuseppina Barbieri, a nurse. Her parents separated before her birth and Tebaldi grew up with her mother in the home of her maternal grandparents in Langhirano. Stricken with polio at the age of three, Tebaldi became interested in music and was a member of the church choir in Langhirano. :32 Her mother sent her, at the age of thirteen, for piano lessons with Giuseppina Passani in Parma, who took the initiative that Tebaldi study voice with Italo Brancucci, a singing teacher at the conservatory of Parma. She was admitted to the conservatory at the age of 17, taking lessons with Brancucci and Ettore Campogalliani, and later transferred to Liceo musicale Rossini in Pesaro taking lessons with Carmen Melis,[and on her suggestion with Giuseppe Pais. She later studied with Beverley Peck Johnson in New York City. Tebaldi made her stage debut as Elena in Boito's Mefistofele in Rovigo in 1944, and performed in Parma in La bohème, L'amico Fritz and Andrea Chénier. She caused a stir when in 1946 she made her debut as Desdemona alongside Francesco Merli as Otello in Trieste. Her major breakthrough came in 1946, when she auditioned for Arturo Toscanini. Toscanini was favorably impressed, calling her "voce d'angelo" (voice of an angel). Tebaldi made her La Scala debut that year at the concert which marked the reopening of the theatre after World War II. She sang the "Prayer" ("Dal tuo stellato soglio") from Rossini's biblical opera, Mosè in Egitto, as well as the soprano part in Verdi's Te Deum. She was given the operatic roles of Margherita and Elena in Mefistofele and Elsa in Lohengrin in 1946. The following year, she appeared in La Bohème and as Eva in Die Meistersinger. Toscanini encouraged her to sing the role of Aida and invited her to rehearse the role in his studio. She was of the opinion that the role of Aida was reserved for a dramatic soprano, but Toscanini convinced her and she made her role debut at La Scala in 1950 alongside Mario del Monaco and Fedora Barbieri in a performance conducted by Antonino Votto. This was the greatest success in her still young career and was to launch her international career. Her voice was used for Sophia Loren's singing in the film version of Aida (1953). She went on a concert tour with the La Scala ensemble in 1950, first to the Edinburgh Festival and then on to London, where she made her debut as Desdemona in two performances of Otello at Covent Garden and in the Verdi Requiem, both conducted by Victor de Sabata. During the early 1950s, controversy arose regarding a supposed rivalry between Tebaldi and the great Greek-American soprano Maria Callas. 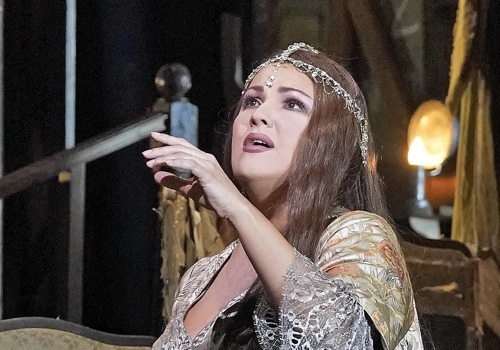 The contrast between Callas's often unconventional vocal qualities and Tebaldi's classically beautiful sound resurrected an argument as old as opera itself, namely, beauty of sound versus the expressive use of sound. In 1951, Tebaldi and Maria Callas were jointly booked for a vocal recital in Rio de Janeiro, Brazil. Although the singers agreed that neither would perform encores, Tebaldi took two, and Callas was reportedly incensed.This incident began the rivalry, which reached a fever pitch in the mid-1950s, at times even engulfing the two women themselves, who were said by their more fanatical followers to have engaged in verbal barbs in each other's direction. Tebaldi was quoted as saying, "I have one thing that Callas doesn't have: a heart" while Callas was quoted in Time magazine as saying that comparing her with Tebaldi was like "comparing Champagne with Cognac. No, with Coca Cola." However, witnesses to the interview stated that Callas only said "champagne with cognac", and it was a bystander who quipped, "No, with Coca-Cola", but the Time reporter attributed the latter comment to Callas.According to John Ardoin, however, these two singers should never have been compared.Tebaldi was trained by Carmen Melis, a noted verismo specialist, and she was rooted in the early 20th century Italian school of singing just as firmly as Callas was rooted in 19th century bel canto. Callas was a dramatic soprano, whereas Tebaldi considered herself essentially a lyric soprano. Callas and Tebaldi generally sang a different repertoire: in the early years of her career, Callas concentrated on the heavy dramatic soprano roles and later in her career on the bel canto repertoire, whereas Tebaldi concentrated on late Verdi and verismo roles, where her limited upper extension and her lack of a florid technique were not issues. They shared a few roles, including Tosca in Puccini's opera and La Gioconda, which Tebaldi performed only late in her career. The alleged rivalry aside, Callas made remarks appreciative of Tebaldi, and vice versa. During an interview with Norman Ross in Chicago, Callas said, "I admire Tebaldi's tone; it's beautiful—also some beautiful phrasing. Sometimes, I actually wish I had her voice." Francis Robinson of the Met wrote of an incident in which Tebaldi asked him to recommend a recording of La Gioconda in order to help her learn the role. Being fully aware of the alleged rivalry, he recommended Zinka Milanov's version. A few days later, he went to visit Tebaldi, only to find her sitting by the speakers, listening intently to Callas's recording. She then looked up at him and asked, "Why didn't you tell me Maria's was the best?" According to Time magazine, when Callas quit La Scala, "Tebaldi made a surprising maneuver: she announced that she would not sing at La Scala without Callas. 'I sing only for artistic reasons; it is not my custom to sing against anybody', she said." Tebaldi made her American debut in 1950 as Aida at the San Francisco Opera; her Metropolitan Opera debut took place on 31 January 1955, as Desdemona opposite Mario Del Monaco's Otello. [self-published source] For some twenty years, she made the Met the focus of her activities. For the 1962/1963 season, Tebaldi convinced the director of the Met, Rudolf Bing, to stage a revival of Cilea's Adriana Lecouvreur, an opera that Bing said he "detested." Unfortunately, Tebaldi was not in top vocal form and cancelled performances, and, as Bing says in '1000 Nights at the Opera', "we had to do the wretched thing without her." She sang more at the Met and far less elsewhere. She had developed a special rapport with the Met audiences and became known as "Miss Sold Out". She sang there some 270 times in La bohème, Madama Butterfly, Tosca, Manon Lescaut, La fanciulla del West, Otello, La forza del destino, Simon Boccanegra, Falstaff, Andrea Chénier, Adriana Lecouvreur, La Gioconda and Violetta in a production of La traviata created specially for her. She was the Leonora in La forza del destino on the night that Leonard Warren died in 1960, and she was Adriana Lecouvreur on the night Placido Domingo made his Met debut in 1968. She made her last appearance there as Desdemona in Otello on January 8, 1973, the same role in which she had made her Met debut eighteen years earlier. By the end of her career, Tebaldi had sung in 1,262 performances, 1,048 complete operas, and 214 concerts. Tebaldi never married. In a 1995 interview with The Times, she said she had no regrets about her single life. "I was in love many times," she said. "This is very good for a woman." But she added, "How could I have been a wife, a mother and a singer? Who takes care of the piccolini when you go around the world? Your children would not call you Mama, but Renata." She had a short relationship with Nicola Rossi-Lemeni and a longer one with Arturo Basile. Tebaldi retired from the stage in 1973 and from the concert hall in 1976. She spent the majority of her last days in Milan. She died at age 82 at her home, in San Marino. She is buried in the family chapel at Mattaleto cemetery (Langhirano). Since February 2010 till 2013, the 15th century Castle of Torrechiara – Langhirano – has hosted within its rooms a permanent exhibition dedicated to Renata Tebaldi. This “Castle for a Queen” unveils the many sides of this great “diva”, whose artistic and personal life remain on display. The items showcased followed her over the arc of time as she spread the world-class tradition of Italian lyrical art…all the way from the beginning of her career and throughout her artistic achievements. The exhibition is presented by the Renata Tebaldi Committee in collaboration with Superintendence of Environmental Heritage and Landscape of the province of Parma and Piacenza, the Regio Theatre Foundation of Parma and the Municipality of Langhirano and with the patronage of the province of Parma. On June 7, 2014, the museum dedicated to Renata Tebaldi was inaugurated in the stables of Villa Pallavicino in Busseto.